Other than for general information and a way to pass the time, avoid purchasing puppies from websites. A pretty website does not mean the breeder is honest, ethical or involved in the breed. You may pay less but that is the downpayment. The 10+ year financial installment payments come later at the veterinarians' office. Do NOT look further if the names of the dogs are only the call names, such as Charlie, Banjo, etc. 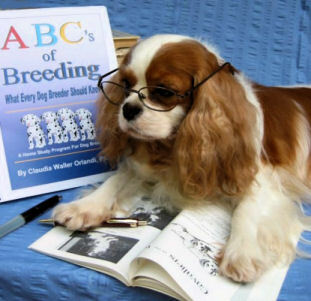 Any breeder who is a student of the breed identifies their dogs by their formal, registered names, as well as perhaps the call names. Do NOT look further if there are no pedigrees listed. Do NOT look further if there is a long list of little individual Cavalier faces pictured for sale or with a “sold” sticker across some of the faces. Do NOT look further if they take credit cards. Do NOT look further if they are imports from Ireland or other parts of the world. Do NOT look further if there are descriptions of the dogs as being "cutie patooties" or similar phrases. Do NOT look further if the guarantee indicates you must return your dog first to get money back for a replacement. Who would do such a thing? Do NOT look further if the PARENTS of the puppy have never seen a Board Certified Cardiologist or Ophthalmologist--at a minimum. Do NOT look further if the name of the website is "Spaniels4U" or "NextDayPets" or "Puppiesondemand" or some such name. Do NOT look further if they register their puppies with any other organization OTHER THAN CKCSC, USA or AKC.